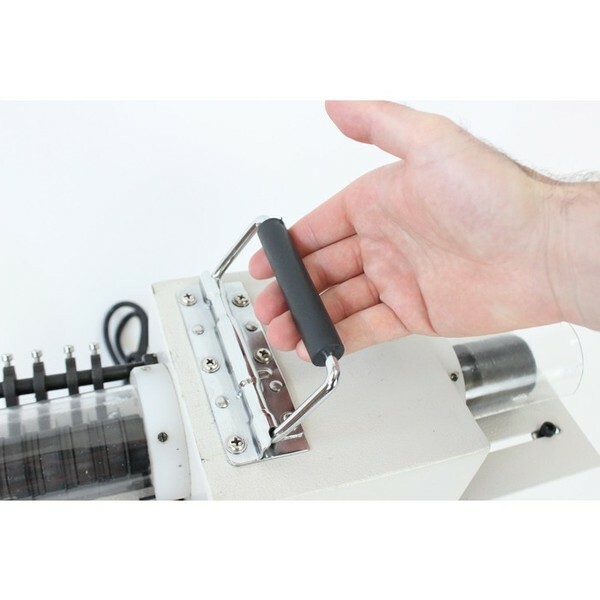 The Techsew 2020P leather strap cutting machine is designed for precision cutting of leather, vinyl, rubber, cardboard and other materials into even strips. This machine can cut material for the production of belts, horse tack, footwear, various leather products and more. The Techsew 2020P is completely portable with a built-in carrying handle and features a gear reduction motor for a controlled cutting speed. Fits perfectly on any bench top and in any workshop. Features: 4" total cutting width capacity 1/4" maximum cutting thickness Cuts any strap width from 1/4" up to 4" Portable with carrying handle Built-in 110V gear reduction motor Reverse rotation switch Operated with foot pedal Built-in pressing roller for gluing edges and folding Includes 5 round cutting blades Weighs 65 lbs. 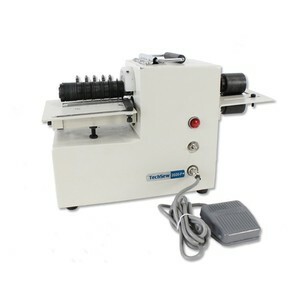 Techsew 2020P Portable Leather Strap Cutting Machine.